Pushed into adulthood with a culinary expertise limited to red-sauce pasta and Maggi, we are in a perpetual state of missing home-made food. And when you’re always running late to the office, you have no time to fix a healthy tiffin for yourself. Gurgaon takes its dabba game up a notch, out of the jurisdiction of the aunty next door and her runner on the bicycle, into the realms of cyberspace. These saviours bring you home food right to your cubicle – every single day. Caterspoint is Gurgaon’s new favourite deliveryman. Serving some really nutritious food, their cuisines vary from home-style food (Sabudana Khichdi) to exotic, gourmet, tossed salads and delectable pastas (the Mushroom Penne comes highly recommended). They also have loads of grilled and cold sandwiches to choose from on their menu. Their refreshing drinks and smoothies are the perfect summer accompaniment! One of Gurgaon’s earliest contributions to the world of the calorie-conscious, delicious dabba food, Calorie Smart is as close as you can get to the origins of the trade. Yes, they’re online, but they offer a monthly post-paid subscription. Their meal plans are designed to cater to any craving. You can select the Indian meal which has home-style food, the Global which includes regional and world cuisines and the Gourmet which is a high-fibre diet for healthy eaters. They do a whole host of salads and a variety of mains – so that’s everything from Tomato Basil Soup and Chicken Croquets, to Chicken Makhanwala and ajwain rice. This daily dabbewala will take care of your desi appetite. Delivering neatly packaged Indian food to offices, they offer a corporate Dabba, a ToGo Dabba or the Daily Dabba. The daily subscription buys you a metal Milton tiffin in which your food is packed hot and fresh everyday. The menu is primarily Indian, featuring household favourites such as Bhindi Masala and Rajma Chawal. Price: Daily (INR 90 per meal), Corporate (INR 75 each for 2 or more orders), ToGo (INR 98). Disclaimer: They only deliver to sectors 38, 46, 47, 48 and 49, Gurgaon. Get pasta, sandwiches, salads, smoothies and more at World in a Box. Locally sourced international cuisine, you can get non-vegetarian, vegetarian and vegan. You can cheat (or not) with the All Meat Salad or do a secret shot with the Old Monk Chocolate Mousse. You can customise your order according to any preferences and allergies, and their regular menu is pretty extensive. This tiffin service based out of South City has so many meal options, it's insane. They're a vegetarian only service that has basic thalis and meals such as kadhi rice, dal rice, and you can customise the meals as per your preference. 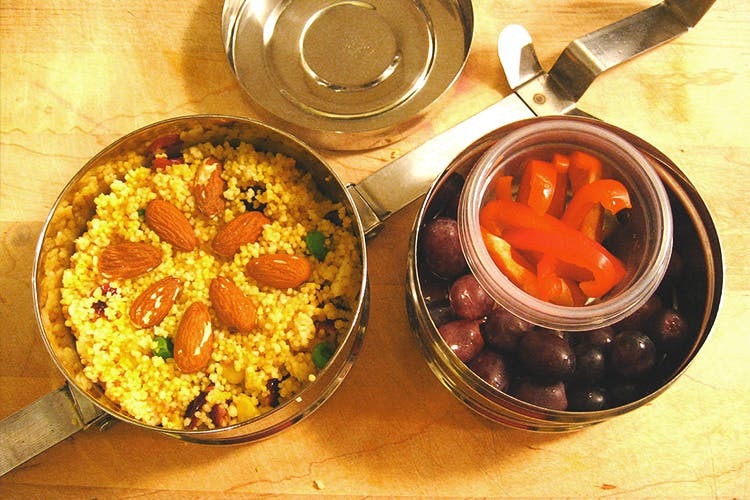 There are options for people who have a small appetite (or small budget) as well- like their mini and eco meal. We've heard great things about their kadhi and kheer.